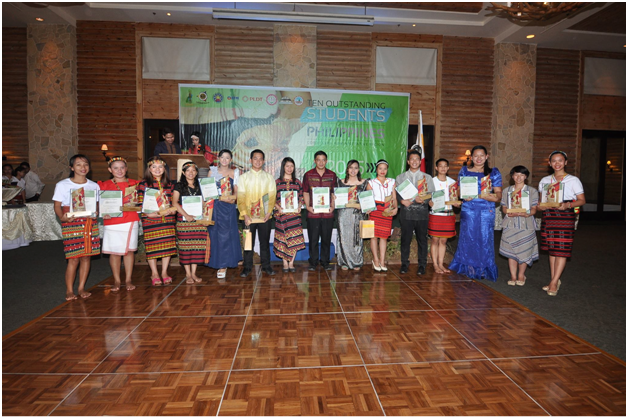 Baguio City, Philippines – On its 21st year in the Cordillera Administrative Region (CAR), fifteen of this year’s best graduates from seven participating colleges and universities were chosen to be regional finalists to the Ten Outstanding Students of the Philippines – CAR (TOSP-CAR). Five of them were chosen on May 14 at Baguio Country Club to be representatives of the region to the TOSP national search. The ten were chosen on the basis of not only their strong academic excellence but also of their leadership, social responsibility, and moral values. The finalists, who call themselves “Batch Aluwagi” from the Itneg term for ‘bayanihan,’ underwent a five-day formation program in Lagangilang and Tubo, Abra. The activities conducted were focused on knowing themselves more, deepening their passion and commitment for leadership and social accountability, and recognizing the needs of the region and nation in whole. Coming from diverse backgrounds, they were able to identify their roles in their respective communities and present them before a select panel of interviewers. “The values strengthened in the formation program and it itself are for the nation. We hope that the new breed of OSCARs (Outstanding Students of CAR)will give back to the community, the region, and the nation,” said Paul Joseph Nuval, one of the alumni-facilitators. For Charlie David Taynan of MPSPC, the formation program served as a “transition from inside [the school] to a bigger community, and a venue of realigning passion to service.” He further said that it made him find the purpose of what he has been doing since he was a student. Similarly, Kama-iSulikam Okubo of UB said she wants to continue her advocacy for financial literacy as this has been strengthened further after undergoing the program. “Before, I tried to simply define or describe outstanding as being above average in mind and action. However, I immediately rejected it because it would mean that those who are not good academically cannot be an outstanding. I have heard the stories of my fellow finalists and from them I can say that being outstanding is about doing more than what is expected of you,” saidMajesty Guingayan of IFSU. Keynote speaker Ms. Betty C. Listino, TOSP-CAR batch 2003 and a researcher, challenged the finalists to continue their passion of leading, learning, and serving their people. He stressed that they have the role of maintaining the rich culture of the Cordilleras amid the fast-developing world. “Say for example, you have a product. It is easy to just say, ‘This thing is glocal [global and local],’ but you have to find the deeper meaning and relevance of the object. What is it for the people who use it? You should not always think of the profit; you should also think of the value of the [cultural] item,” Listinochallenged. “It is our shared role to take care of our identity as a unique people,” she added. Started as an awards program in 1961 by Jose Concepcion Jr., the TOSP search has evolved into a celebration and affirmation of role models who will soon act as leaders in the community. This year marks the 21st year of the program in CAR, and the 11th year of the conduct of a formation program, as well as the establishment of the OSCAR Alumni Community, which facilitates the annual regional search program.